These set of products provide the basic components for a fully functional ambient light system, including support for optional reality effects hardware. 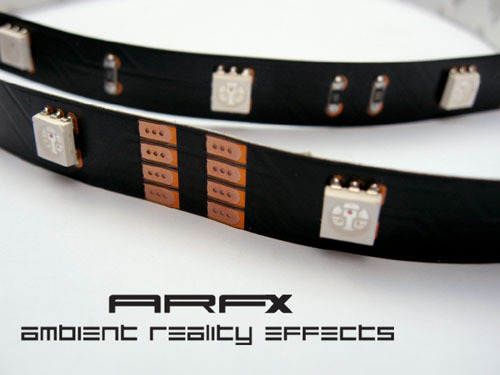 ARFX USB interface also includes the ARFX software, and provides you with the option of connecting any of your own DC devices (LED's or other DC devices rated at up to 24VDC, 2A). In this page, we also offer our LED strips. Re-branding of the application and hardware modules is available for qualified vendors. Assembling these products requires some technical skills. For building your own custom setups, see this handy Quick Reference schematic.